This article was first posted on this link http://home.swbell.net/zweebach/clear.html This is a copy of the original article and pictures with no alterations, the original writers email is at bottom of article. 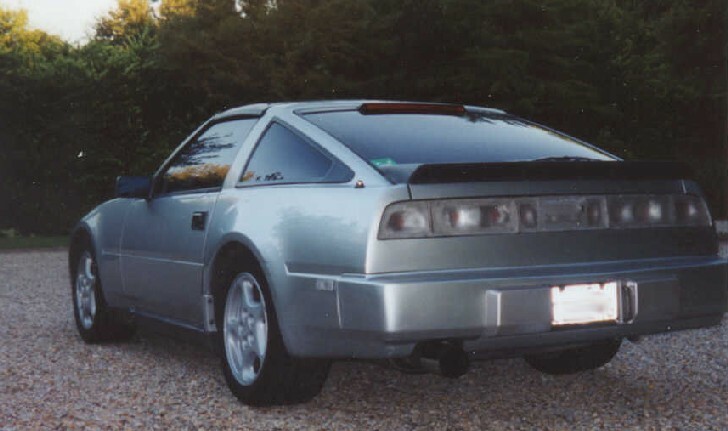 These are basic instructions on how I made clear turn signals, side markers, and tail lights for my 1988 300ZX (87-89) I can't guarantee that these same things will work on 84-86 Z's, but the idea should transfer for those cars. If you're going to undertake this project, I suggest starting with either the front turn signals or the side markers. The side markers are easier to remove from the car (1 10mm nut on the inside of each fender), but require destruction of the lens to remove the lens. The turn signals may require removing the front bumper cover - not hard, but time consuming. The front turn signals are attached to the bumper cover on each side of the signal light - the bumper reinforcement may prevent you from getting to the screws. To take off the bumper cover, I would recommend a deep well 10mm socket for the nuts on the inside of the fender. That or put your 10mm socket on the nut and then put the driver in the socket (the threaded part might too long to get the socket on normally otherwise). There are pieces that are completely flat, but the prisms are too big in my opinion (there are also other weird designs). I got the diffuser with the smallest prisms; I think that looks closest to the stock lens diffuser patter. The plastic is somewhat flexible when it's in a large sheet, but when it's cut down smaller it's much stiffer. The plastic costs around $18. To attach the plastic to the lens housing, I started out using some GE Silicone Sealant - this works all right, but it has a slightly white hue to it. I later switched to another sealant. It's made by DAP. It's perfectly clear, pretty sticky and worked well. It just smells bad. Both of these come in a caulk tube, which is what I used. To remove the lens from the turn signal just pry it off. Use a screwdriver around the edge and it should start to come off. There's some gray adhesive type stuff holding it on, but it's not very strong. Use the orange lens as a guide and cut out some of the clear plastic in a rectangle a little bit larger than the lens. To cut the plastic, use a razor blade to cut through the plastic about halfway, and then bend it on that cut to snap it off. It might help to have a straight edge along the cut to make sure the plastic breaks along that line. To fit the clear lens on the housing, you must trim the metal reflector inside the housing. Bend the reflector up a bit so you can get to it. Then use some tin snips or similar tool to trim the corners off - just enough so that it will lay flat in the housing without protruding out of it. Test fit the clear lens on the housing - make sure it covers the whole thing. Clean off the back of the lens - you don't want gunk inside your light. Apply a good bead of sealant in the groove on the housing (where the original lens came out of). Mate the clear lens to the housing (bumpy side to the sealant side), making sure the prism pattern is straight with the housing. Clamp it and let it dry. Use a Dremel Tool, or similar to trim away the excess plastic (plastic should be flush with housing). Finish smoothing your edges with some find sand paper. Re-install in the bumper. -Notes: the orange lens cover is convex sort of, you'll see what I mean. The clear lens is flat. This will cause there to be a small gap between the bumper and the turn signal lens - you can see it better at some angles than others. If this bothers you, maybe you don't need clear turn signals. The stock bulb is clear. You may want yellow ones to be legal (I left mine clear and haven't had any problems yet - I like the way it looks better). If you can't find an 1157 amber bulb, you can paint the bulb - just regular spray paint works, use the color you want the light to be, or a 2057 bulb will work. You have to grind down one of the nubs on the 2057 to fit it in the socket. To remove the colored lens from the side marker light, you must break the plastic lens off of the backing. Be careful on this, the housings may be somewhat brittle and easy to break. What worked best for me was using a nail and putting it through the hole for the bulb. Then hit it with a hammer to break through the lens. Continue to break off pieces of the lens until all large pieces are gone. Sand the housing a bit to remove the smaller remnants of the lens. I primed the housing and painted them the color of my car (silver). This makes it look more like there isn't even a light on the car when it's not lit. Before painting, trace out, or get an idea of the size of clear plastic lens needed. While the paint is drying, cut out the clear plastic to make lenses for the side markers. Apply sealant to the housing around the light bulb recess. Mate the clear lens to the housing, bumpy side to sealant. Make sure you line up the rows of prisms with the edges on the housing: otherwise it may look weird. Clamp and let it cure. Use a Dremel or similar tool to sand and shape the lens to match the housing. Smooth it with some fine sandpaper. Re-install in fenders. - Notes - the colored lens is molded and has edges that wrap around the sides of the housing. The clear lens is flat and does not do this. Because of this, your sealant or adhesive that you use will be exposed, visible, etc and may discolor or just plain not look good. It is also hard to get a smooth texture to the sealant after it has dried - sanding it makes it rough. You could try using a clear epoxy or another adhesive hear and you may get better results. I left my bulbs clear - this is legal for side markers - they can be yellow, red or clear. There are plenty of other colored bulbs if you desire these - or you could just spray some paint on clear ones. The plastic lenses come off - it takes some work, but they do. You have to take out all of the screws on the back of the housing, warm up the whole tail light and then start prying the lens off the back housing. There's this really strong yellow stuff that holds them together. To warm up the housing you can use a heat gun or an oven. The heat gun method is obvious. I used the oven with pretty good results. Set the oven to 250 - 300 F. Open the door a little so that the taillight rests on the lip of the door and also keeps the door open (housing side toward the oven). Stay and monitor this process. As the housing gets warm start trying to pull the lens off; use screwdrivers to pry and keep the lens and housing separated. If it's really hard to get the lens off, heat it some more. Be very careful. Don't walk off while the light is heating in the oven - it will melt. 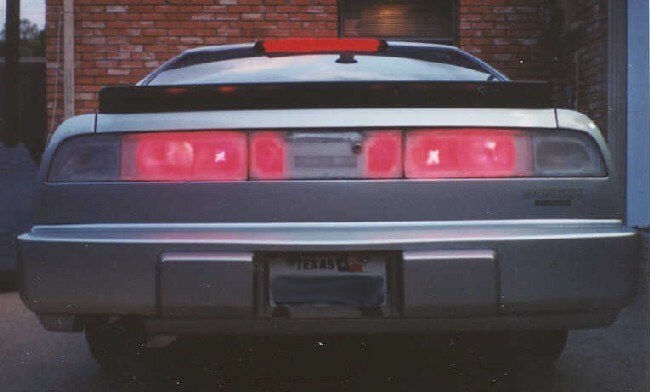 I know, good thing I bought the extra set of taillights. Now that the lens is off, there are some other clear plastic diffusers inside. I didn't reuse these. Start cutting the plastic to fit inside the housing. 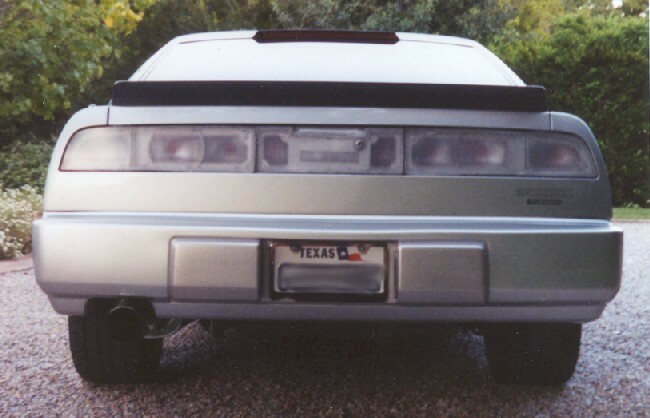 On the taillights, I made the lens fit inside the lip around the housing - not as easy as just sanding it down to fit. There is a double ridge separating the brake light from the taillight that one of the diffusers rests on - you must trim this down even with the shorter of the two ridges - this allows the clear lens to sit in the housing. I painted the housing insides completely silver to match the car (I masked off the metal reflector piece). I didn't bother trying to get all of the yellow stuff out. It is too hard and sticky to deal with and I never found any solvents that loosened it. Continue trimming and test fitting your lens in the housing. Don't trim too much at once you want a pretty tight fit. Apply sealant to the outside edge of the housing and mate the lens to the housing, bumpy side to sealant. Clamp and let dry. Re-install in car. -Notes- the taillights ended up being pretty difficult. Originally I had the lens flush with the outside of the housing - the lens was basically resting on the housing with the sealant holding it in place - this didn't work so great, in fact the lens separated from the housing before I installed them in the car, that is why I changed to fitting the lens inside the lip of the housing. These were hard to get waterproof too. It started raining one day and my car was in the rain for 20-30 minutes. One of the taillights was half full of water - it's somewhat amusing now, but I was pretty annoyed then. The water inside the lights also tends to make bulbs fail. Now, after all that, if you still decide to try this, I wish you luck. If I haven't answered questions well enough here, Feel free to email me and ask. I'm happy with my results so far. As I mentioned in the notes after each individual procedure, there are things I am not completely satisfied with. If I come up with a better alternative, I'll up date this. The one nice thing about the silicone or dap sealants is that they are rubbery and can be completely removed from the surface. You can undo what you've done and try again. If you try and use epoxy or a similar adhesive this won't be the case. email me for questions on this topic.